LAS VEGAS—For $20 per month, Sling TV is a big step toward breaking up big channel bundles, but don’t expect all the comforts of cable if you plan to be an early adopter. Dish announced the service earlier this week, and will launch it publicly later this quarter. The basic package offers a dozen channels including ESPN, CNN, and the Food Network, with additional mini-bundles available for $5 per month. I gave Sling TV a spin during CES, and while it capably handles its basic duties of streaming live TV over the Internet, it also has its fair share of missing features. The basic interface is simple enough. The channel guide appears along the bottom half of the screen in a translucent window, with a horizontal list of channels on top and that channel’s lineup underneath. 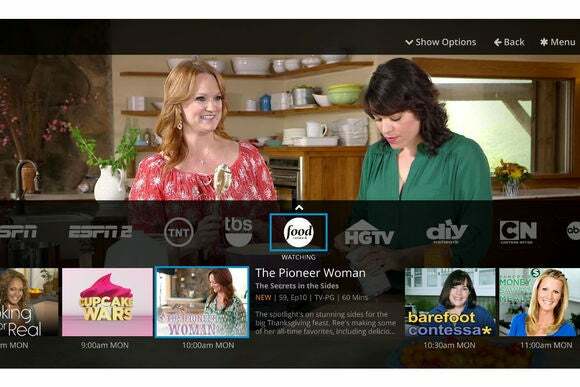 It’s the perfect design for this kind of service, which doesn’t have a huge list of channels and therefore doesn’t need the grid view of a typical cable channel guide. Because the video window doesn’t shrink while flipping channels, you don’t feel like you’re pulled out of the action. The channel guide also reveals Sling TV’s coolest feature: For certain channels, you can scroll back in time and watch anything from the last three days. On the downside, it’s entirely up to content providers to support this feature, and not all of them are going to. Considering that Sling TV doesn’t support DVR-like functionality—likely because of licensing issues—your on-demand options are going to be slim. Dish isn’t exactly to blame for those limitations, but some of its other wounds are self-inflicted. For instance, you can’t set up reminders to watch favorite shows, which seems necessary given the lack of DVR service. Dish also hasn’t announced a way to control television video playback from a phone or tablet, even though this is now a standard feature on most cable services. Sling TV’s content sorting options seem a bit odd as well. From the menu, you can choose to filter by genre, but this does nothing except reduce the already-small number of channels in the main guide view. It’d be better if the filter gave you a list of programs from across different channels. Finally—and this is a niche, nitpicky complaint—I wish Sling TV had better support for Android TV. Currently, it doesn’t feed the recommendations bar on Android TV’s home screen, so you can’t get recommendations and reminders on things to watch. Despite all these complaints, Sling TV is one of the most exciting things I’ve seen at CES. While it’s not the à la carte service that people have been dreaming of, it’s a way to cut the cost of TV without giving up Monday Night Football. And like other streaming services, it does away with cable’s unsavory pricing and billing practices . Here’s hoping Dish can make it hum a little more smoothly in the coming months.